Television stations cover a press conference in Iraq. Photo: United Nations Assistance Mission for Iraq, Flickr. In a landscape driven by political ownership and partisan media, what possibility is there for the media to fulfil its role as watchdog, calling those in positions of power to account? The media as battlefield is not a new concept. For a strong democracy to function, the media is considered an essential spoke in the democratic wheel, a chance for representative and opposing views to be aired and robustly debated. In western democracies, it is often said that the media should both reflect society and shape attitudes, keeping governments and those with power in check. But what happens when the media is entirely driven by political partisanship, the views and motives of its funders? What chance do individual journalists have of providing information that is free, independent and accountable? If one were to flick through the various media platforms and channels in Iraq, they would see markedly different versions of supposedly the same story. For the journalists and reporters producing news and programming content, it can be difficult to see beyond the day to day and it is highly likely that many journalists themselves struggle not to let their political beliefs dictate their practice. Yet despite this overall environment, there are a number of journalists producing exemplary work in Iraq, work that is exposing corruption as well providing narratives that embrace rather than erase or demean Iraq’s culture diversity. This research project aims to examine what is driving these ‘pockets of civicness’ in a highly partisan media landscape. To answer this question, I will travel to Iraq to conduct interviews with a number of journalists, working in three of Iraq’s largest cities: Baghdad, Basra and Mosul. I will also interview academic professionals, media development organisations, and civil society groups that are working on developing platforms and practice to support independent media and accountable journalism. It is currently an interesting time to be conducting fieldwork of this nature in Iraq. A number of key events have taken place in recent months, namely the defeat of ISIS, an apparent reduction in sectarian division, a newly-appointed government and ongoing civilian protests and anti-establishment sentiment. All of these events are impacting on the work of journalists across Iraq and form the basis from which I have selected my corpus of journalists to interview. I will interview journalists who are covering these events fairly, with transparency, accuracy and humanity. What are journalists’ perceptions of the media landscape in Iraq and of coverage of recent key events? What changes, if any, have they noticed in media coverage over the last few years? What are their key motivations and drivers for working as journalists? What forms of training, if any, have they participated in in order to further their professional skills and ability? What role do they think that they play, or could play, in the current Iraqi political context? What are the structural conditions that they feel are either impeding or aiding this? 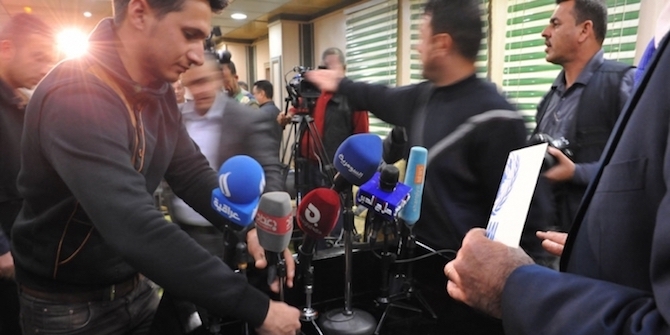 What are their expectations for the future of the Iraqi media? I will also explore some of the more outstanding pieces of journalism that have been published in Iraq, focusing on investigative work that may have impacted on policy and political narratives in the country. These will be highlighted as case studies in my research paper and the findings triangulated with the findings from the interviews and meetings that will take place in November. Some preliminary conversations have highlighted the important role that international organisations, funding and recognition are playing as key drivers of higher quality independent journalism. However, local media are also beginning to figure prominently in the information ecosystem of Iraqi audiences. It should be particularly interesting to interview Iraqi journalists to find out what their perceptions are of both the prevailing and future media landscape in Iraq. My aim is to uncover motivations and drivers in order that these can eventually be used to develop training programmes for journalists, not only those in Iraq, but also others working in comparably challenging contexts across the region and beyond. *This blogpost introduces the LSE research project ‘Pockets of Media Civicness’ in a Conflictual Political Landscape: A Case Study of Iraqi Media by Aida Al-Kaisy, examining opportunities for enabling Iraqis to carve out spaces which can contribute to better journalism and, ultimately, better local and national governance. This project forms part of the Conflict Research Small Grants Programme, funded by the UK Department for International Development to provide research and policy advice on how the risk and impact of violent conflict might be more effectively reduced through development and governance interventions. Aida Al-Kaisy is a Media Reform Advisor and has worked extensively on media development projects across the MENA region including in Iraq, Palestine and Tunisia. Bad Behavior has blocked 376 access attempts in the last 7 days.